As we enter a new era in American politics, a stark threat is building. Mankind's dependence on fossil fuels has put our civilization in peril. Our world becomes increasingly more populated every day, putting even more pressure on our already dwindling supplies of crude oil. If we continue down the same road we have been traveling for the past fifty years, we face certain disaster. Steadily rising temperatures will accelerate the melting of polar and glacier ice, threatening our environment in ways we have only begun to understand, and may eventually lead to low-lying areas like Florida and New York City being swallowed by rising waters. On land, plains and savannahs may turn into deserts, and a global food shortage could spread, as places that were once covered by arable farmland turn to arid dust. These aren't scenes from some apocalyptic doomsday movie. In fact, the vast majority of scientists warn that this is the world that awaits us if we continue to ignore the ramifications of the huge carbon footprint created by our dependence on fossil fuels. For this reason, clean energy has become the most important political and environmental issue of our time. Clean Energy Nation is an eye-opening look at the world's history with fossil fuels and what we must do in the next century to save our environment. 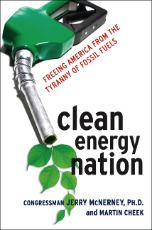 With a specific focus on the current American dependence on oil, this book delivers a sobering call to action. Here, Jerry McNerney, the only United States Congressman ever to have had a career as a renewable energy engineer, and writer Martin Cheek inspire all Americans to take action to free our country from its dangerous addiction to oil and help steer us toward the goal of genuine energy independence. The book outlines a realistic plan that will help us survive the next 100 years and beyond. Looking to such alternative energy sources as solar, wind, water, biofuel, geothermal, and hydrogen-based power, McNerney and Cheek stress the need to get started immediately, not to continue debating small details. Creating hundreds of thousands of domestic jobs, increasing productivity, decreasing pollution and greenhouse gases, and lessening international conflict are some of the positive outcomes of a switch to clean energy. Perhaps most important, moving to a clean and renewable energy infrastructure will safeguard our nation's freedoms by making us more self-sufficient in meeting our energy needs. Americans are already feeling the pressures of the current energy situation, and many of us are ready to make a change. Clean Energy Nation is a timely and hopeful look at an issue we can't afford to ignore.